It should go without saying that a trademark application takes time and money to pursue. There are fees to be paid, and documents that have to be filed periodically to maintain the trademark. So the fact of the application in itself tells you that ‘Hyrule’ is a term that Nintendo does not want anyone else to be able to use. Trademarks generally apply to protect logos and brand names. In this case, however, Nintendo has applied for a standard character mark, meaning it is not a particular logo it wants protected but rather the actual term ‘Hyrule.’ This gives Nintendo protection over a broad range of uses, and not just the obvious Hyrule Warriors logo. All these things heavily imply that Nintendo plans on using ‘Hyrule’ regularly for the next decade or so. It probably is not possible to keep milking Hyrule Warriors for that long. So does that mean there will be new Hyrule Warriors-type spinoffs in the works? Or a Hyrule Warriors sequel? 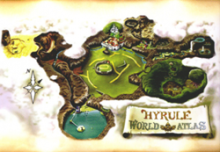 It may be that the upcoming Zelda Wii U game will feature the word ‘Hyrule’ prominently in the title. I mean they cannot keep calling it Zelda Wii U forever. We do not have much to go on here, so what are your thoughts? Give us your opinions in the comments below!